DJ Wild slot is set against a backdrop of a nightclub and features all the equipment of a Mixing DJ and which would create the slot's soft Trance music soundtrack, with futuristic zapping as the reels start and spin. The symbols are nicely defined against a dark background and in pauses between spins the background pulses between different colours of light. So will DJ Wild slot have you up on the floor? This game is all about the reels as we have no bonus round as such. The symbols are all stacked up to 3 rows high so can fill any of the game's 5 reels in full. There are 10 pay lines each way from left to right and right to left, similar to their Champions Goal slot. The pays aren't any better this time though as the top pay is 10x bet for 5-of-a-kind Wilds or keyboards followed by 5x for the mixing deck, 3x for the turntable and 2x for the headphones. 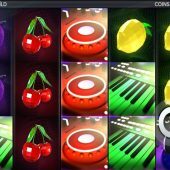 there are no card values but we have old-style fruits such as melon, lemon and cherry paying 1x or 0.8x stake for a full 5. The only adornment this game has is the 'DJ Wild' when it appears. It can occur on all reels except the centre one because the centre DJ Wild is actually a jackpot trigger so you'll not see it in normal play - unless you're extremely lucky in which case you'll receive 500x bet! Any DJ Wild appearing will expand either one position adjacent horizontally or vertically to fill the reel. You then get a re-spin after any wins are paid - should another DJ WIld appear then another re-spin is awarded and so-on. That's your lot.